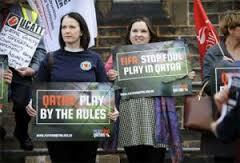 In a rare move, the ILO threatened to establish a Commission of Inquiry if Qatar fails to act in the coming year. Such commissions are among the ILO’s most powerful tools to ensure compliance with international treaties. The UN body has only established 13 such commissions in its century-long history. The last such commission was created in 2010 to force Zimbabwe to live up to its obligations. The report and the ILO warning are all the more embarrassing for Qatar given that its main competitor, the United Arab Emirates (UAE), has already adopted many of the adjustments of the kafala or sponsorship system that puts workers at the mercy of their employers demanded by activists and is stepping up efforts to become the region’s prime sports hub. The report and the warning further threaten to erase considerable goodwill that Qatar built in the wake of its 2010 successful World Cup bid by breaking with the mould of Gulf states’ refusal to engage with their critics, and holding out the promise of a more constructive relationship with international human rights groups and trade unions, and significant labour reform. Qatar became the only Gulf state to work with its critics rather than imprison them or bar them entry to the country as most of the region’s other countries continue to do. The Amnesty report constitutes however the first documentation of abuse on a World Cup-related site and punches holes into the assertion by the Supreme Committee for Delivery & Legacy, the World Cup’s organizer which is chaired by Qatar emir Sheikh Tamim bin Hamad Al Thani, that its standards for the living and working conditions of migrant labour guard against abuse on construction sites related to the tournament. Amnesty takes the committee and the government to task for failing to ensure proper implementation of the standards that are written into all contracts signed by the committee since they were adopted in 2014 in consultation with Amnesty and other human rights and trade union groups. It also charges that FIFA failed to due proper due diligence to identify and address human rights risks in Qatar in line with the United Nations Guiding Principles on Business and Human Rights. “FIFA did not put in place any measures to ensure that the people who would build the World Cup infrastructure in Qatar would not be subjected to human rights abuses. None of the publically available documentation on FIFA’s award of the 2022 World Cup to Qatar contains any reference to labour exploitation or to ensuring that human rights of workers would be respected… Of even greater concern is the lack of action by FIFA in the last five years, during which time labour and human rights abuses experienced by construction workers in Qatar have been repeatedly exposed by the media, human rights groups and trades unions,” the report said. The human rights violations of migrant workers, who constitute a majority of the Qatar population, including interest-bearing recruitment loans, deception over pay rates and job descriptions, delayed wage payments, retention of passports, denial of rights to travel home, squalid living arrangements, excessive surveillance, and physical and verbal abuse by managers, amount to forced labour. The continued abuses violate the supreme committee’s standards as well as limited legal and administrative measures adopted by the government to counter malpractice and reform the kafala system. In a statement, the Supreme Committee for Delivery & Legacy insisted that it was “committed to ensuring the health, safety and well-being of every worker on World Cup projects.” It asserted that “the tone of Amnesty International’s latest assertions paint a misleading picture and do nothing to contribute to our efforts.” The committee said Amnesty had interviewed workers of only four of the 40 companies involved in the refurbishment of the Khalifa stadium and that “the conditions reported were not representative of the entire work force on Khalifa.” The committee said that issues raised by Amnesty have since been addressed and that the companies involved had been penalized. Nonetheless, at the root of Amnesty’s criticism of Qatar is the Gulf state’s failure to ensure implementation of its standards throughout the food chain. The companies indicted by Amnesty were sub- rather than prime contractors, the main committee’s main focus. The criticism however puts a finger on a fundamental Qatari problem in ensuring proper implementation of policies its adopts. That failure is rooted in logistical issues – a small, enriched population reliant on migrant labour – and political dilemmas, first and foremost among which paralysis as a result of existential demographic fears. With a citizenry that accounts for only 12 percent of the population, many Qataris fear that any concession of rights to non-Qataris could ultimately undermine the national predominance of their culture and political control of their state and society. As a result, Qatar is caught in a Catch-22 between sports, foreign and other policies designed to put the Gulf state in the international limelight and enhance its soft power and the attention and demands that those policies attract in terms of making good on projecting itself as a cutting-edge 21st century state. “Asian football is benefiting tremendously from Dato' Alex Soosay's unrivalled expertise and experience of the world game in his role as a consultant to the Asian Football Confederation (AFC). 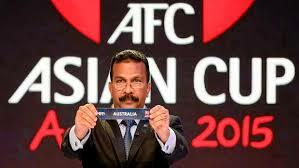 He has the ability to contribute significantly on specific projects in which he has detailed knowledge such as the extension of the AFC building and the AFC Asian Cup. Dato’ Alex has the full support of the AFC President, General Secretary and management in this role which will assist the future development of the AFC as it strives to become the world's leading football confederation,” the AFC said in a statement. Asked in the video why Mr. Soosay would want the documents tampered with or hidden, Mr. Kuan said: "I'm not sure ... possibly because he is afraid he may be accountable for signing the payment instruction and that he didn't question it." Human rights groups and trade unions have nonetheless grown increasingly frustrated with the government’s failure in the last five years to incorporate the standards in national legislation. Qatar’s failure looms large with the United Arab Emirates’ announcement of labour reforms described by Human Rights Watch researcher Nicholas McGeehan as "a huge improvement and something we would fully support and applaud." In the summer of 2010, within the al Shabaab extremist group-controlled areas of Somalia, watching the World Cup placed many civilians at the risk of flogging, amputations and even executions. To the people in power, football – or soccer as it's known in the United States – infringed on their ambitions, namely that of jihad, or holy war, and it had to be stamped out. With Europe once again on high alert following the deadly terrorist attacks in Brussels on Tuesday, which left 34 people dead and more than 230 wounded and came on the heels of November's ISIS attacks in Paris, officials have raised concerns that terrorists could target the upcoming Euro 2016 tournament. The competition, which pits the best international teams in Europe against one another every four years, will be hosted in 10 stadiums across France, beginning on June 10. "It has to be a concern because we know that ISIS is looking for soft targets," Margaret Gilmore,senior associate fellow at the Royal United Services Institute, said Wednesday. Thus, attacking a football event, like Euro 2016, would have great value for a terrorist group, given the sport's popularity and what it represents to some extremists. Certain extremist groups have long viewed football as contradictory to their messages of strict religious adherence and conformity. From their perspective, football represents Western ideals, and the cross-cultural assimilation it engenders is counter to their ideological values. As a result, for those groups — namely, al Shabaab and Boko Haram in Africa and the Islamic State group, also known as ISIS, in the Middle East — attacking football sends a message beyond invoking fear. There have been several instances where football was at the backdrop of terrorist attacks in Europe. In 2002, a car bomb was detonated outside of the Santiago Bernabeu stadium in Madrid, where Real Madrid plays their home games. Most recently, in November, three suicide bombers tried to enter the Stade de France, where a France-Germany football match was taking place, as part of the widespread Paris attacks. A similar plan was thwarted that same month for an international match in Hanover, Germany. For these groups, football is an invitation from "the infidels" and is viewed as a "detraction from their religious obligations," James M. Dorsey, senior fellow at the S. Rajaratnam School of International Studies at Singapore's Nanyang Technological University and creator of The Turbulent World of Middle East Soccer blog, said on Wednesday. That's not to say extremists' relationship with football isn't complicated. Four years after al Shabaab was executing Somalis for watching the World Cup, the group actively began organizing its own football matches — including games with locals — albeit with highly limited regulations. This was, in part, because the people making the rules themselves enjoyed the sport. ISIS purportedly has 400 fighters trained to attack Europe in semi-autonomous cells scattered across parts of Europe. This leaves countries like France and Belgium particularly vulnerable to attacks because of their open border policy and stated commitment to bringing in refugees — something that could mean more terrorists crossing their borders from North Africa. In contrast, the United Kingdom was better protected against attacks for the 2012 Olympics, in part because they had stricter border regulations in place. However, France wouldn't have earned the Euro bid without a strong, detailed security plan, Gilmore said. For their part, French Interior Minister Bernard Cazeneuve has said they will put everything in place so they can guarantee "collective security" for the monthlong tournament. This includes the government hiring 10,000 people for private security — with organizers hoping for more planned hires before June — and over 900 agents mobilized across the country for the 51 scheduled matches. Similarly, UEFA — the organizer of the European competition — have stated that safety and security are at the center of its plans. UEFA: "wishes to reaffirm its commitment in placing safety and security at the centre of its organisational plans for Euro 2016"
UEFA has no current plans to hold the tournament behind closed doors — a tactic which has been used for single-event football matches before. For the sake of the safety of fans, though, Republic of Ireland manager Martin O'Neill has said he would be willing to let his team compete, begrudgingly, under the policy. "If that is an alternative and it's the only alternative, then if we are going to have the competition, we may have to comply with it," O'Neill said, in an interview with the Irish Independent. But being the first tournament closed to the public is antithetical to the spirit of Euro 2016 and, more broadly, the sport. "If you're going to hold a Europe-wide tournament, and you're going to exclude the public, you've defeated the purpose of the tournament," Dorsey said. "You've handed your opponents — in this case groups that commit political violence — you've handed them a victory on a silver platter." Miles is an editorial fellow at Mic, covering culture. He is based in New York and can be reached at miles@mic.com. Lifting sanctions in fact opened large opportunities for the resource-rich Islamic state to push forward its long stagnated industry. Intensified visits to Tehran in an effort to find a deserved place in the perspective Iranian market are reality of the past few months. But could Russia really become the favorite partners in the oil and gas industry of Iran is now debated by experts unambiguously. Iran and Russia have recently voiced their intention to develop all-out cooperation in the energy sector - from swapping oil and gas to involving Russian companies in the development of Iran's oil and gas fields. The removal of the international sanctions on Iran and the recent improvement of Tehran’s relations with the Western countries have tackled the competition among the energy companies for the vast Iranian market. Russia is among these states. Russian companies are keen on participating in the development of oil and gas fields in Iran and eye projects for increasing Iranian oilfields’ recovery rate. After the 5+1 agreement with Iran and lifting of sanctions over the Islamic Republic's energy sector, Iran officially invited all foreign companies to invest in the country's oil and natural gas, LNG, petrochemical sectors. Gazprom, Lukoil and other Russia companies were active in Iran as well. Energy analyst Omid Shokri Kalehsar said that after 5+1 agreement, the CEO of Lukoil has announced that Lukoil is to reopen it office in Tehran. "Gazprom is also ready to get back Iran giant South Pars filed. Russia firms are also active in Iran nuclear sector. And Iran is planning to made agreement with Rosatom to build new nuclear power plant in Iran," he told Azernews. Iran's Oil Minister Bijan Namdar Zanganeh expressed his country's interest in intensifying energy cooperation with Russia in the post-sanctions era. Such a statement was made at a meeting with Russian Energy Minister Alexander Novak in Tehran on March 14. Novak, who addressed the journalists after the meeting with Zanganeh said that Iran has right to be exempted from crude output cuts to stabilize the market "with an aim to remedy the losses inflicted on its economy from international sanctions." "Since Iran’s production decreased under sanctions, we totally understand Iran’s position to increase production and revive its share in the global markets,” he noted. Energy ministers of Russia, Saudi Arabia, Venezuela and Qatar agreed to freeze the oil output after the negotiations in Doha on February 16. They decided to stabilize oil output at the level of January 11, if other major exporters follow the suit. Such a decision was aimed at dealing with decreasing oil prices and relieving the glut on the world oil market. Kuwait and UAE also joined this deal. James Dorsey, a senior fellow at Nanyang Technological University's S. Rajaratnam School of International Studies, believes that believes that the Islamic Republic has made clear that it will not subject itself to quotas "as such it is likely to win market share if others voluntarily cut production." Kalehsar, in turn, noted that Iran’s first priority is to recover its oil production capacity at the level of before sanctions. "Before the EU and the U.S. imposed economic sanctions on Iran, the Islamic Republic produced some 4.5 million barrels of oil per day and now, the country is planning to produce such amount of oil in a short term. Iran does not care more about oil prices. Iran expects from OPEC and non-OPEC members to free oil production, but allow Iran to produce more oil and recover its oil production capacity," he noted. The Islamic Republic, after the removal of international sanctions, is planning to take its rightful share in the world energy market, primarily as a major natural-gas exporter. Iran with the world’s second largest gas reserves and the fourth largest oil deposits, has already declared its readiness to re-enter the global oil and gas market. Tehran is looking for markets to target, and Europe is interested in Iranian gas as the primary objective of the EU is the diversification of energy resources and decrease of gas dependence on Russia. One can expect that the relations between Tehran and Moscow will worsen if Europe replaces Russian gas to Iranian blue fuel. However, Dorsey believes that Russia will have to balance its differences with Iran over energy with its other interests in the region that involve Iran such as Syria. "As a result, it is unlikely to put those other interests at risk," he said. Kalehsar, in turn, said that exporting natural gas to the European consumers is Iran's long term plan as Iran needs about 6 billion euros of investment for construction of relevant pipeline. "It is clear that the EU energy demand is decreasing, and the EU is planning to import LNG from the U.S. to decrease its dependency on Russia gas. Sooner or later Iran will export gas to the EU as Iran needs market for its gas. Iran is also planning to use Oman LNG facilities to produce LNG in Oman and export it to the EU," he stated. Tehran has been considering various destinations for diversifying energy supply routes and transporting its natural gas to Europe. Ukraine, which has energy refining and export infrastructure, could take a significant share on the Iranian market by meeting the needs of a post-sanctions Iran. 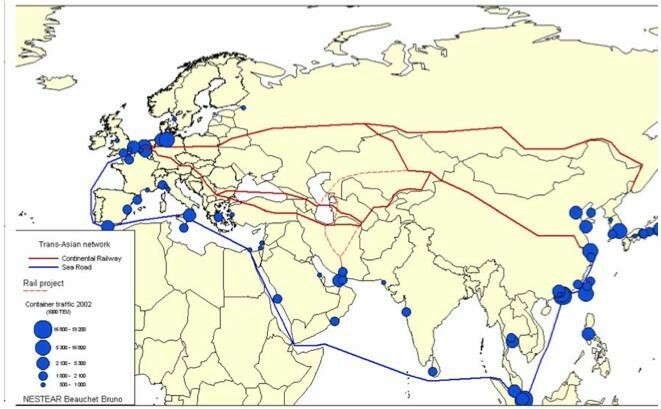 Also, Ukraine's potential to transit Iranian blue fuel to Europe, is the most important factor for Iran, which has been working to figure out ways to enter the European gas market. Commenting on the affect of such a transit operation to Tehran's ties with Moscow, Dorsey said Russia realizes that Iran makes a point of acting in its own interest and not easily buckling down to pressure. "Russia needs Iran as much as Iran needs Russia. 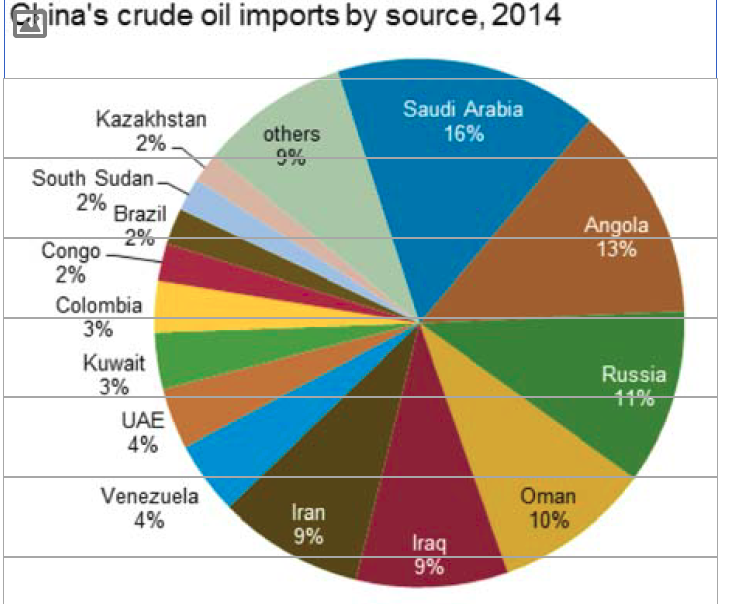 As a result, oil exports to Ukraine are not going to make Moscow happy but unlikely to create a breaking point. Moreover, Russia realizes that Ukraine will no longer accept dependency on Russia," he added. Kalehsar, however, is pessimistic on the possibility of this transit. "The main question is in which pipeline Iran can export gas or other fuels to Ukraine. Iran has to build pipeline but due to the Ukraine's security and stability problem, I am not sure that foreign companies will invest in such projects," he said. RSIS offers a challenging graduate education in international affairs, taught by an international faculty of leading thinkers and practitioners. The Master of Science degree programmes in Strategic Studies, International Relations, Asian Studies, and International Political Economy are distinguished by their focus on the Asia Pacific, the professional practice of international affairs, and the cultivation of academic depth. Thus far, students from 65 countries have successfully completed one of these programmes. In 2010, a Double Masters Programme with Warwick University was also launched, with students required to spend the first year at Warwick and the second year at RSIS. A select Doctor of Philosophy programme caters to advanced students who are supervised by senior faculty members with matching interests. Research takes place within RSIS’ five components: the Institute of Defence and Strategic Studies (IDSS, 1996), the International Centre for Political Violence and Terrorism Research (ICPVTR, 2004), the Centre of Excellence for National Security (CENS, 2006), the Centre for Non-Traditional Security Studies (Centre for NTS Studies, 2008); and the Centre for Multilateralism Studies (CMS, 2011). Research is also conducted in RSIS’ Studies in Inter-Religious Relations in Plural Societies (SRP) Programme. The focus of research is on issues relating to the security and stability of the Asia Pacific region and their implications for Singapore and other countries in the region. The School has five endowed professorships that bring distinguished scholars and practitioners to teach and to conduct research at the school. They are the S. Rajaratnam Professorship in Strategic Studies; the Ngee Ann Kongsi Professorship in International Relations; the NTUC Professorship in International Economic Relations; the Bakrie Professorship in Southeast Asia Policy; and the Peter Lim Professorship in Peace Studies. China’s increasingly significant economic and security interests in the Middle East have several impacts. It affects not only its energy security but also its regional posture, relations with regional powers as well as the United States, and efforts to pacify nationalist and Islamist Uighurs in its north-western province of Xinjiang. Those interests are considerably enhanced by China’s One Belt, One Road initiative that seeks to patch together a Eurasian land mass through inter-linked infrastructure, investment and expanded trade relations. Protecting its mushrooming interests is forcing China to realign its policies and relationships in the region. As it takes stock of the Middle East and North Africa’s volatility and tumultuous, often violent political transitions, China feels the pressure to acknowledge that it no longer can remain aloof to the Middle East and North Africa’s multiple conflicts. China’s long-standing insistence on non-interference in the domestic affairs of others, refusal to envision a foreign military presence and its perseverance that its primary focus is the development of mutually beneficial economic and commercial relations, increasingly falls short of what it needs to do to safeguard its vital interests. Increasingly, China will have to become a regional player in competitive cooperation with the United States, the dominant external actor in the region for the foreseeable future. The pressure to revisit long-standing foreign and defence policy principles is also driven by the fact that China’s key interests in the Middle East and North Africa have expanded significantly beyond the narrow focus of energy despite its dependence on the region for half of its oil imports. [i] Besides the need to protect its investments and nationals, China has a strategic stake in the stability of countries across the Eurasian landmass as a result of its One Belt, One Road initiative and the threat of blowback in Xinjiang of unrest in the Middle East, North Africa and Central Asia. China has signalled its gradual recognition of these new realities with the publication in January 2016 of an Arab Policy Paper, the country’s first articulation of a policy towards the Middle East and North Africa. But, rather than spelling out specific policies, the paper reiterated the generalities of China’s core focus in its relations with the Arab world: economics, energy, counter-terrorism, security, technical cooperation and its One Belt, One Road initiative. Ultimately however, China will have to develop a strategic vision that outlines foreign and defence policies it needs to put in place to protect its expanding strategic, geopolitical, economic, and commercial interests in the Middle East and North Africa; its role and place in the region as a rising superpower in the region; and its relationship and cooperation with the United States in managing, if not resolving conflict. Dr James M. Dorsey is a senior fellow at the S. Rajaratnam School of International Studies, co-director of the University of Würzburg’s Institute for Fan Culture, and the author of The Turbulent World of Middle East Soccer blog, a forthcoming book with the same title, as well as a forthcoming book co-authored with Dr Teresita Cruz-Del Rosario, Comparative Political Transitions between Southeast Asia and the Middle East and North Africa. James is expanding this working paper into a book with the same title. Formulation of Chinas emerging Middle East and North Africa strategy is shaped as much by contemporary U.S. predicaments in the region as it is by the fact that post-Cold War differences between major powers are about power, influence, geopolitics, and economic interests rather than a global ideological divide. China’s formulation of a policy towards the region is complicated by the fact that it occurs at a time that the United States and China are adjusting to one another in a world in which China is on the rise. That is certainly true for the Middle East and North Africa given that China bases its positions on a set of foreign and defence policy principles that at least nominally contrast starkly with those of the United States and are intended to ensure that China does not repeat what it views as U.S. mistakes. While there appears to be broad consensus in China on this approach, China’s policy community is divided on a host of questions related to the complicated process of marrying their country’s foreign policy principles with a comprehensive policy towards the Middle East and North Africa that takes the region’s complexities and difficulties into account. These questions involve issues like the posture China should adopt towards the region as a whole, its major powers and numerous conflicts, and the protection of Chinese interests. They range from the sustainability of the region’s autocracy to the rise of Islam as a political force, the emergence of violent strands of the faith, and the continued viability of the existing borders of the Middle East and North Africa’s nation states. Underlying the debate is the question whether China can afford to continuously respond to events as they occur rather than develop a coherent policy. At the crux of the debate is ironically the same dilemma that stymies U.S. policy in the Middle East and North Africa: the clash between lofty principles and a harsh reality that produces perceptions of a policy that is riddled with contradictions and fails to live up to the values it enunciates. Increasingly, China is finding it difficult to paper over some of those dilemmas by harping on the principles of non-alignment and non-intervention and offering economic incentives. The Chinese debate goes to the core of China’s vision of its role in world affairs. It is forcing China to revisit its view of itself as what China scholar David Shambaugh described as “a partial power that is “hesitant, risk adverse and narrowly self-interested” and that “often makes it known what it is against, but rarely what it is for.”[iii] Chinese officials and analysts who argue against moving away from adherence to their country’s established foreign policy and defence guidelines worry that a watering down of China’s principle will take it into more risky, uncharted territory or down a road that has gotten the United States at times tangled into knots. Remaining aloof may however be easier said than done as China’s economic stake in the region increases and conflicts in the Middle East and North Africa escalate and potentially spill out of the region and closer to home. The significant expansion beyond energy of key Chinese interests in the region makes standing aside ever more difficult. Besides the need to protect its investments and nationals, China has a strategic stake in the stability of countries across the Eurasian landmass as a result of its One Belt, One Road initiative and the threat of blowback in Xinjiang of unrest in the Middle East, North Africa and Central Asia. For many in the Chinese policy community, this elevates the need for cooperation with the United States to the level of an imperative. The question however is: on whose terms? The answer is a subtle sidekick to the larger battle between the United States and China over who will write the rules for the international system and the global economy in the 21st century global economy that is being fought out in the South China Sea and the creation of Chinese-led institutions like the Asian Infrastructure Investment Bank (AIIB) and the Shanghai Cooperation Organisation (SCO) that groups Central and South Asian states. Middle Eastern and North African states have provided initial answers to the question in terms of their expectations. While realising that they are likely to remain dependent on the United States’ regional defence umbrella, Gulf States have begun to look towards Asia, and China specifically, as a power that can at least partially compensate for growing doubts about U.S. reliability. The late King Abdullah of Saudi Arabia already highlighted those expectations by making China the first country he visited after his coronation in 2006. In doing so, Abdullah, like other Middle Eastern leaders, also see relations with China as a way to pressure the United States to re-engage in the Middle East and North Africa and become more supportive of their often divisive policies. Nonetheless, the contours of what an updated policy would have to look like and the assumptions on which it would have to be based have begun to emerge from the Chinese debate as U.S. prestige fluctuates and its credibility lessens. The United States’ standing in the world has been weakened as a result of the Afghanistan and Iraq wars, U.S. waxing and waning in Syria and in its relations with Saudi Arabia, and its narrow regional focus on confronting IS, the jihadist group that controls a swath of Syria and Iraq. China is, however, not yet at the point at which it is willing and/or able to clearly articulate its strategic interests or intentions in the Middle East and North Africa beyond its drive to secure resources, investments and people and expand its influence through economic ties and its One Belt, One Road initiative. As a result, China’s strategic dialogues remain focussed on free trade agreements with the six-nation, Saudi-led Gulf Cooperation Council (GCC) and Israel rather than the forging of broader strategic partnerships that go beyond economics with any one country or group of countries in the Middle East and North Africa. Chinese reluctance is further informed by a belief that U.S. support for political change in the Middle East and North Africa was misguided. Officials see subsequent U.S. reluctance to become embroiled in the region’s conflicts, foremost among which Syria, and its inability to nudge Israelis and Palestinians towards a resolution of their dispute, as indications of waning U.S. influence. All of this suggests that China and the U.S. could, for example, find common ground on the principle of adherence to international legality, a principle Obama emphasised when he was first elected and whose interpretation is driven as much by power politics and interests as it is by ideology. Moreover, international relations scholar Jian Junbo suggested that if China can cooperate with the United States and other Western countries in countering terrorism, “they should also be able to help each other to protect their interests overseas.”[xvii] Cooperation has so far been complicated by major policy differences symbolised by the frequent blocking of resolutions regarding Syria by China and Russia that have largely rendered the United Nations Security Council impotent. Like Russia, China’s approach to the resolutions was rooted in a sense that the United States had abused a 2011 UN Security Council resolution authorising humanitarian intervention in Libya to pursue the toppling of Qaddafi. China’s policy approach to the Middle East is reinforced by its conclusion from the U.S. predicament in the region that no one power can help the region restore stability and embark on a road of equitable and sustainable development. “Replacing the U.S. is a trap China should not fall into,” Wang Jian, director of the Shanghai Academy of Social Sciences’ (SIIS) West Asia and North Africa Research Centre, said. At the same time, he justified Chinese non-interference with the government’s conviction that the chaos in the region meant that this was not the time to intervene – an approach that many in the Chinese policy community believe allows China to let the U.S. stew in its own soup. Nevertheless, doubts about U.S. reliability and perceptions of waning U.S. influence are forcing China to prepare for the day when it will need or want to ensure its own energy security. The Chinese debate on the management of relations with the U.S. appears to have informed China’s first articulation of a Middle East policy with the publication in in January 2016 of an Arab Policy Paper[xviii] on the eve of President Xi’s visit to the Middle East and North African, the first by a Chinese head of state in seven years. The paper shied away from spelling out concrete policies. Instead, it reiterated long-standing principles of Chinese foreign policy like non-interference in the internal affairs of other states, dialogue, and win-win modes of cooperation as they applied to the Arab world and emphasised China’s key interests in the region: economics, energy, counter-terrorism, security, technical cooperation and its One Belt, One Road initiative. Hesitancy to become embroiled in the Middle East and North Africa’s pitfalls appears to still be the basic instinct of Chinese leaders even though facts on the ground inevitably push them towards greater engagement. And the stakes for China are rising as its interests in the region mushroom. Energy and resource security are key to China’s continued economic growth and rising standards of living on which the legitimacy of the Communist Party of China (CCP) rides. Add to that, the geo-strategic importance of Middle Eastern and North African states as hubs for access to African and European markets and their centrality to China’s One Belt, One Road strategy is obvious. Finally, as was evident in China’s complex compliance with international sanctions against Iran and Xi’s visit to the Middle East, balancing Chinese relations with rival Middle Eastern states as well as the United States as they relate to the region is increasingly resembling the act of a dancer on a tightrope. China’s plans to invest in an array of Pakistani projects, including a 1,700-mile trade ‎route to the Gulf illustrate the politics of its One Belt, One Road Initiative. Xi Jinping believes that he can achieve Chinese dominance through investment and inter-connected infrastructure. In doing so, China is convinced that it can succeed where the United States has failed. It expects its massive investment will serve as an incentive for Pakistan to step up its crackdown on Pakistani militants and to end the support of the country's intelligence service, Inter-Services Intelligence (ISI), for radical Islamist groups. China hopes moreover that Chinese-built transport infrastructure could spur economic development in its troubled north-western province of Xinjiang where harsh measure‎s against the cultural practices of the Uighurs have fuelled Islamist violence. A job boom in Xinjiang would allow the government to further dilute Xinjiang's Uighur population through the immigration of non-Uighurs. Xi first gave a foretaste of Chinese priorities in the Middle East and North Africa when he outlined in June 2014 his country’s policy framework towards the region with the announcement of the One Belt, One Road initiative. [xxxviii] “The Silk Road is an important guide for China’s Middle East diplomacy,” said Wang Jian. 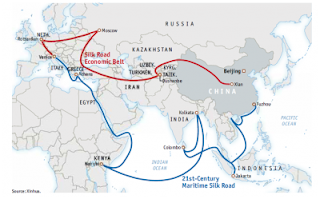 “Arab countries are at the western intersection of One Road, One Belt,” added SIIS’s Ye Qing. In effect, One Road, One Belt is the latest version of concepts to spread China’s influence westwards that date back to 138 B.C. when the Han dynasty first dispatched emissaries to establish economic and political relations with the Middle East which inaugurated the Silk Road that for more than a millennium has linked China by land to Persia and by sea to the Arabs. 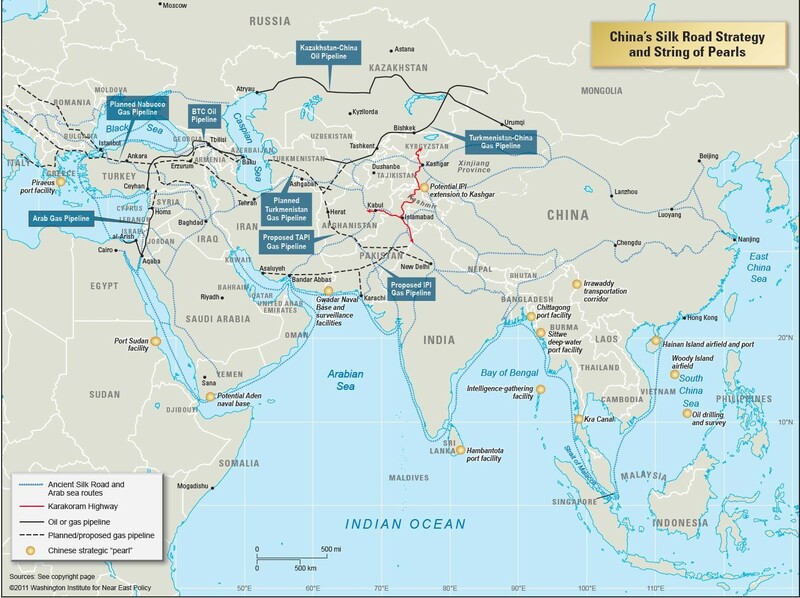 One Belt, One Road is driven by a logic similar to and traverses much of the territory covered by the ancient Silk Road. International relations expert Wang Jisi argued in 2012 that China should respond to the United States’ pivot towards Asia and the Pacific by filling diplomatic and economic by voids in central Asia, south Asia and the Middle East created by the U.S. withdrawals from Iraq and Afghanistan. If the U.S. approach is rooted in the Washington Consensus, a set of value-oriented free market economic ideas, supported by international organisations such as the IMF and the World Bank, China’s approach amounts in the words of political scientist Mojtaba Mahdavi to a non-ideological Beijing Consensus, a mercantilist policy that is “another form of neo-liberalism with Chinese characteristics”[xlv] focused not only on securing resources and global transportation routes but also on access to consumer export markets and access to innovative technologies. 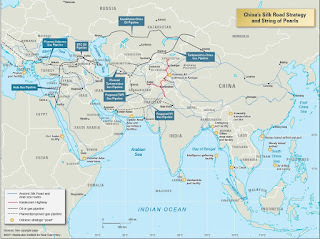 Leaving aside the sheer audacity and scope of Xi’s Silk Road project that focuses on integrating the enormous swath of territories between China and the Middle East by concentrating on infrastructure, transportation, energy, telecommunications, technology and security, applying China’s lofty principles is easier said than done and raises a host of unanswered questions. Its insistence on multi-polarity as opposed to U.S. dominance in the Middle East implicitly means that the status of the U.S. in the region would have to deteriorate further significantly before Washington, despite Obama’s inclination to consult with others, would be willing to entertain the Chinese approach. The extent of China’s policy debate as it relates to the Middle East and North Africa is further evident in the way Chinese officials, policy analysts and former ambassadors to the Middle East conceptualise China’s approach in discussions with their scholarly Western and Arab colleagues. The debate is coloured by what appear to be generational differences. Often older current and former Chinese officials appear to attribute greater importance to the formal aspects of political processes rather than political realities on the ground. One expression of that view is their emphasis on the outcomes of elections irrespective of whether they were free and fair and represent a voluntary expression of popular will. A case in point are Chinese official statements supporting the re-election in June 2014 of Syrian President Bashar al-Assad despite the fact that the vote lacked legitimacy or credibility in a country in which the government no longer is in control of all of its territory and has demonstrated a willingness to retain power irrespective of cost. This approach camouflages Chinese support for autocratic regimes in the Middle East and North Africa behind a veil of declared non-interference in a country’s domestic affairs and recognition of a government legitimately constituted in nominal terms. It is, despite Chinese denials, a policy akin to the U.S. emphasis on stability in the region rather than adherence to liberal American values. It is a policy for which the United States, Europe and the international community have paid dearly given that it produced the violent and often brutal undercurrents of change that are sweeping the Middle East and North Africa as well as the emergence of jihadism, forces that increasingly also threaten Chinese interests. 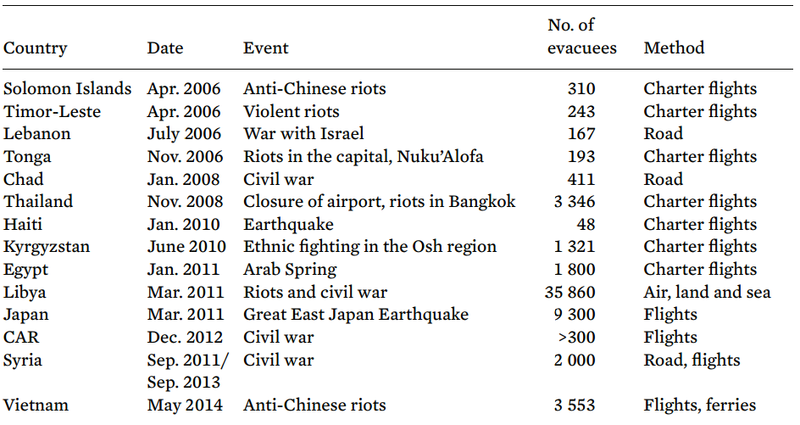 Current and former Chinese officials often frame the debate by emphasising external rather than domestic drivers of crisis in the Middle East. To be sure, Chinese policymakers and politicians do not have to take into account powerful ethnic and national lobbies like the Israel, Gulf, Turkish, Armenian and Greek groupings that play an important role in the formulation of policy in the United States. These domestic drivers and the growing realisation that China will at the very least have to be opportunistic about adherence to its policy principles have helped to narrow the gap between hardliners and moderates. Hardliners favour a more assertive policy already visible since 2009 in China’s soft military approach to the Middle East and North Africa as opposed to proponents of a more conservative policy that harks back to former Chinese leader Deng Xiaoping’s maxim of keeping a low profile that would allow China to avoid challenging U.S. regional hegemony and benefit from conflicts sapping U.S. strength. [lvii] The gap is narrowed by the fact that China has de facto already let go of Deng Xiaoping’s maxim. Beyond Libya, China was forced to remove in 2011 Chinese students from war-torn Syria, in 2014 some 20,000 people from northern Iraq after IS conquered significant chunks of the region,[lxi] and a large number in 2015 from Yemen where a Chinese warship docked while special forces protected the boarding Chinese and other foreign nationals. The Middle East and North Africa’s violent convolutions have persuaded some Chinese analysts that the region has become a testing ground for an inevitable adjustment of Chinese policy principles, including the notion of non-intervention. Their views are rooted in realities on the ground as well as Mao Zedong’s belief that the Middle East and North Africa was a key arena for the struggle against the hegemony of superpowers. [lxiv] Mao’s assessment like Chinese approaches to the region today was driven by China’s definition of its national security interests rather than a desire to resolve the Middle East and North Africa’s seemingly intractable problems.